Music will always touch us, but how will we touch music? Swearing out loud while attempting to dislodge a CD from the case isn’t the same as tearing the plastic from a new album. Once, that was a near-holy experience. I’m as big a fan of MP3s as anyone – my first generation iPod is proof. But I miss the days when I experienced music with my hands and eyes as well as my ears. 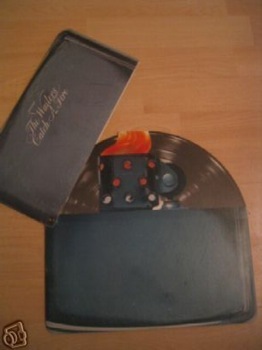 Remember liner notes, gatefold sleeves, covers that were cut in strange shapes, like the Zippo lighter that flipped open to reveal the Wailers’ “Catch A Fire” LP, or could change appearance, like the figures in the windows on Led Zeppelin’s “Physical Graffiti”? How do you stuff something like that onto a digital music player? There’s a lot of talk these days about the warm sound of vinyl records. A few artists, like Tom Petty and Ryan Adams, doggedly refuse to stop releasing LPs. Bless them, but what about the warmth of LP packaging? The original release of the Who’s “Quadrophenia” had a 24-page booklet that I could spread out on my lap to read. Today, that would be possible if a CD jewel case were made out of magnifying glass; then perhaps I cold decipher the lyrics without going blind. Besides, with discs all but dead, even that’s become a luxury. When it was introduced in 1983, the compact disc shrunk an album’s canvas to about one sixth of its former size. I challenge you to name one great record cover created since then. One British graphic designer created several iconic album jackets –Led Zeppelin’s “Houses of the Holy,” Wings’ “Venus and Mars” and T Rex’s “Electric Warrior” are just a few. But this company, Hipgnosis, only produced two CD covers. Most of their work came before the CD arrived. Hipgnosis was responsible for almost all of Pink Floyd’s covers, including one which best exemplifies the visceral experience of music that I’m trying to recall now. “Wish You Were Here” featured a disturbing photograph of two men shaking hands – one of them is on fire. The cover art was hidden beneath dark shrink-wrap, and the only way to see it was to buy the record and open it. Try stealing that experience off of the Internet. Engaging record sleeves, like the pair of pants with a real zipper on “Sticky Fingers,” or the manhole texture of Talking Heads’ “Fear of Music,” have no counterpart in the digital world. Thursday: Johnny A., Inn on the Blues – All soul patch and swagger, this guitarist came through the rock and roll ranks with Boston band Hearts on Fire and a long stint with former J. Geils front man Peter Wolf. Like the Geils band, Johnny stands at the crossroads of rock and blues. This is especially so at his live shows, when he mixes triplets and chords with aplomb. Friday: Hexerei, Claremont Moose – Through personnel changes and music business cruelties, Claremont’s heavy metal hope perseveres. Gratefully, their third studio album won’t share the fate of Guns n’ Roses “Chinese Democracy.” Tonight’s show features a slate of local bands, and next week (site TBA) Hexerei welcomes fans to a listening party for the eagerly anticipated “Pay Your Dues” – site TBA. Saturday: Barbary Coast Jazz Ensemble, Hopkins Center – The farewell show for members of the Class of 2008. This student-led band is a Dartmouth College tradition. Surprisingly, it’s made up mainly of non-music majors; they nonetheless have the opportunity to perform with world-class musicians in addition to collegial collaborations. Tonight, the seniors are the celebrities. Sunday: Meg Hutchinson, Armadillo’s – This Keene burrito joint has suddenly become a hotbed for the New England folk scene, welcoming the likes of Mark Erelli, Chris O’Brien and this unique singer-songwriter, who will appeal to Shawn Colvin fans. This regular Sunday series, booked by Orange Earth Productions, has upcoming visits planned from Catie Curtis and the amazing Jeffrey Foucault. Monday: Eliza Gilkyson, Fox Run Concerts – House concerts are a wonderful addition to the music community. They’re a way for fans to get up close and personal with their favorite performers, and a means for arts patrons to show support. Fox Run shows happen at assorted locations in Western Massachusetts. Gilkyson’s songs mix confession and commentary. To find out more, visit http://www.foxrun.org. Wednesday: Paul Rivers, Elixir – A guitar teacher at the Sharon, Vermont Independent School for the Arts (which hosts a student recital tonight if you’re interested), Rivers joined Boston phenoms Teddy & the Pandas near the end of their Sixties run, opening for everyone from the Turtles to Buddy Miles to the Kingsmen. These days, he’s playing acoustic at places like Canoe Club and Elixir, all the while hoping to find a blues band.